Some of the process of the brick working on this tiny place was seen in another topic,which recieved great interest,and so now that the complete Railway Station is finished,I thought you might like to see the end result ,but there are no rails laid yet,so these little people will have a long wait and I fear the school children will not get to school today.However, I don`t think they will mind. This place, is somewhere in the England of my youth & imagination. The year is 1953 & this is the tiny ancient Hamlet town of HoneyWell which I am scratchbuilding. So this is HoneyWell Station. Shown now just for you. At this present time I`ve just set this up on my small work table,just to give you a birds eye view of what it will look like. I finished a sample of pavement today,just in time to catch the light of day & shoot these pictures. 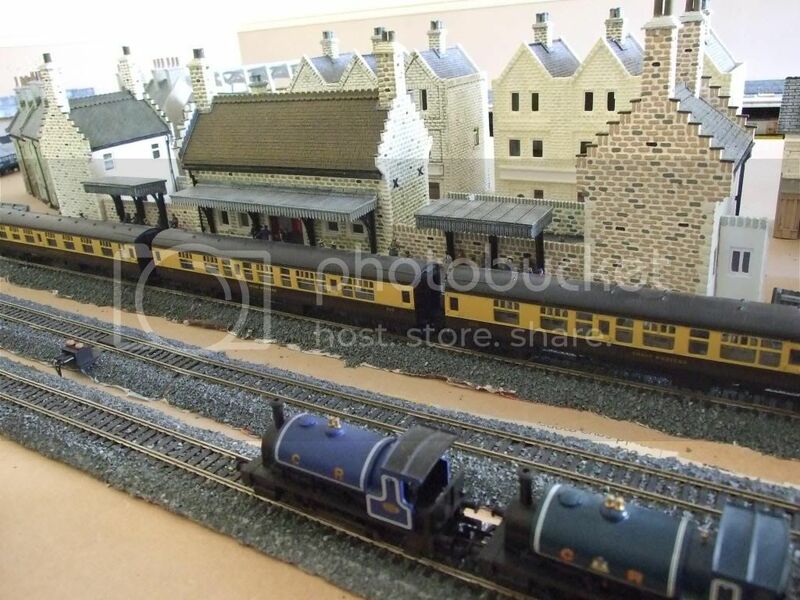 the railway is on the other side of the building ? Your work is very impressive, you know ? 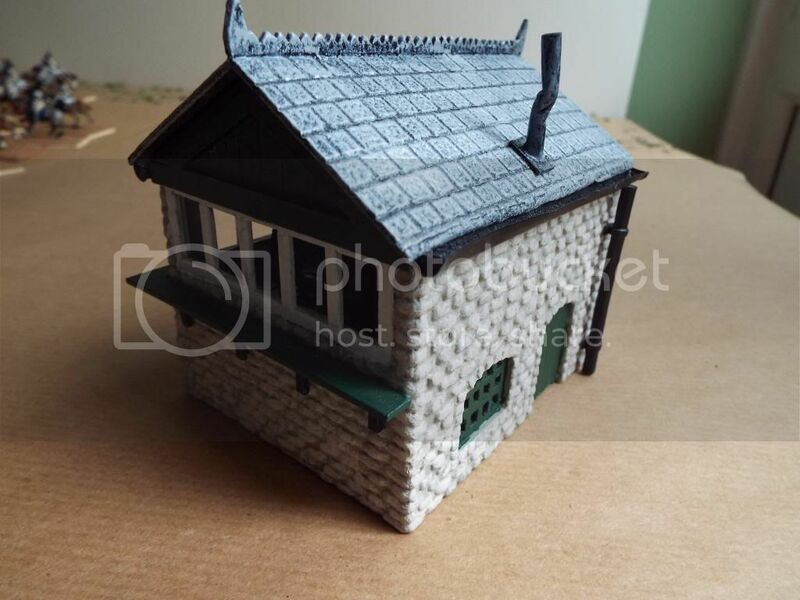 Here`s the other side Pascal.I`ve placed two oo scale rail track`s just to give you idea of what the working end of HoneyWell Station will look like. 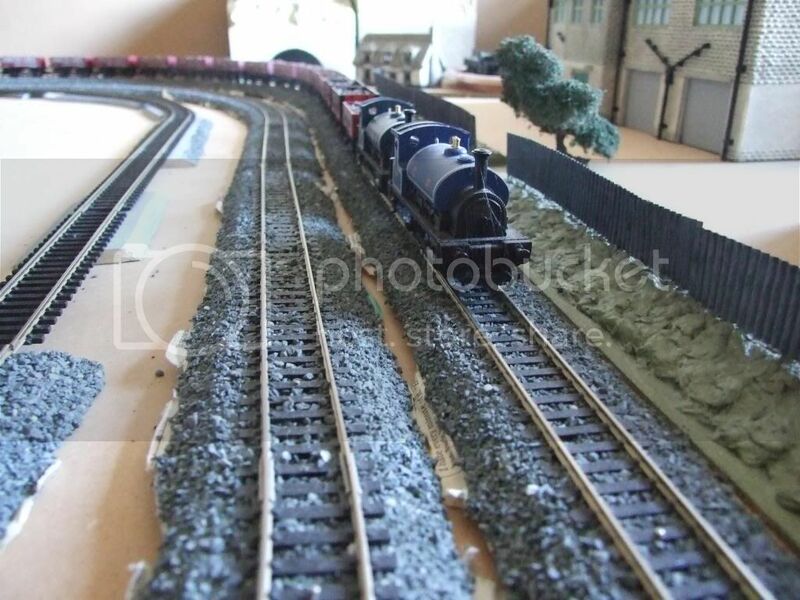 However the track`s on the proper layout is much higher then can be seen here. 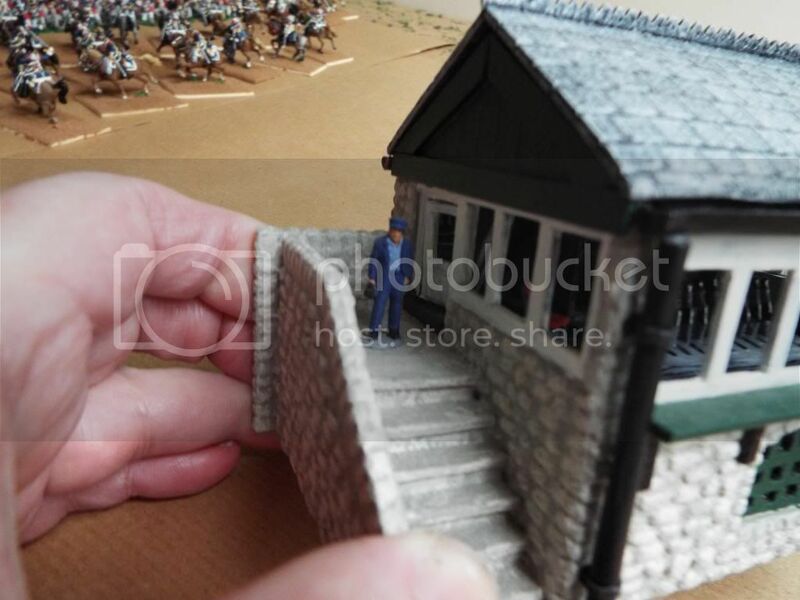 Here are some 20mm Dapol figures & some of mine too. The platform is filling up. I`m sorry to say,"They`ll have quite a long wait." 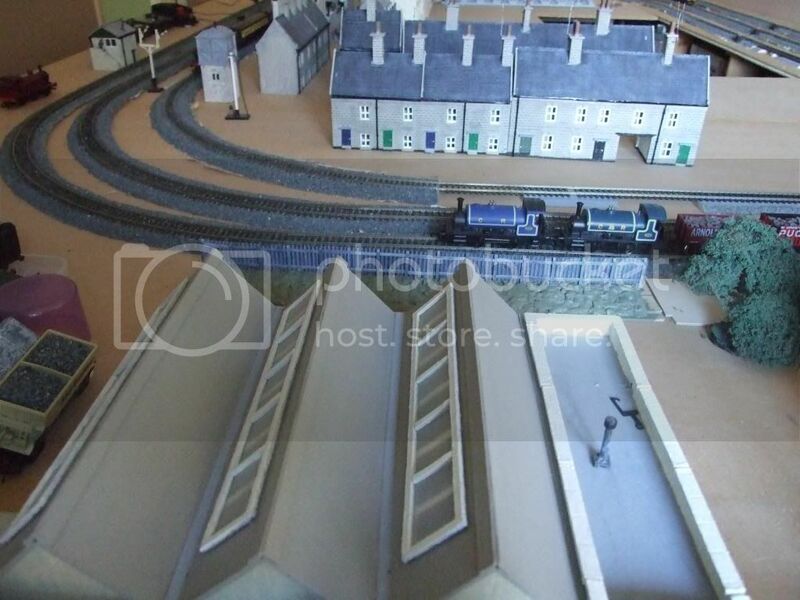 Well I`ve got to relay the track upon the layout! 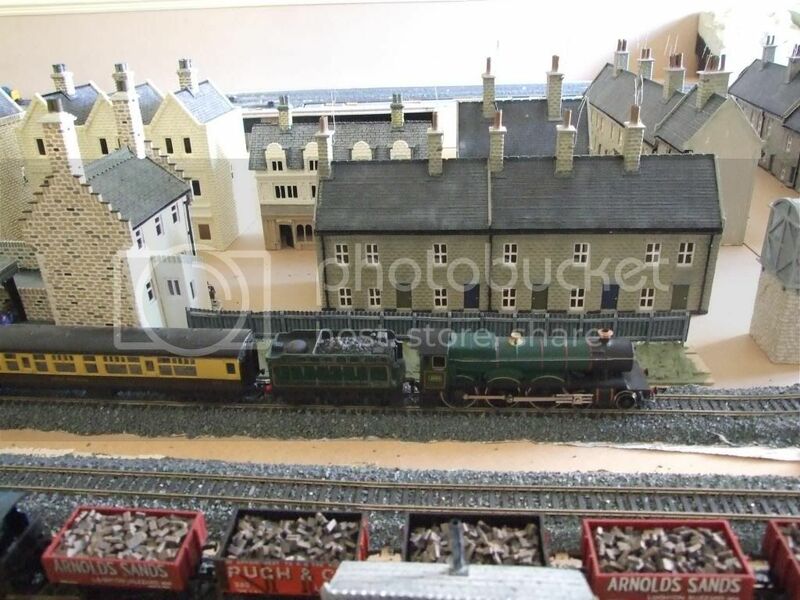 There will be four OO scale rail track`s passing by this busy little Station. Here are a few more figures . Gosh! 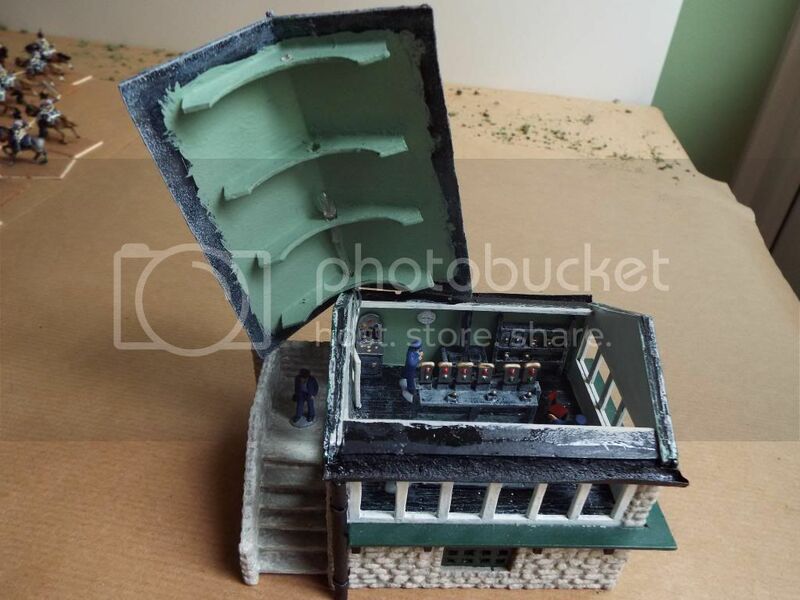 It`s made so the main building lifts off,and gives oppertunity for you to see the other model figure`s at the front again. see it`s back#! Now a word. 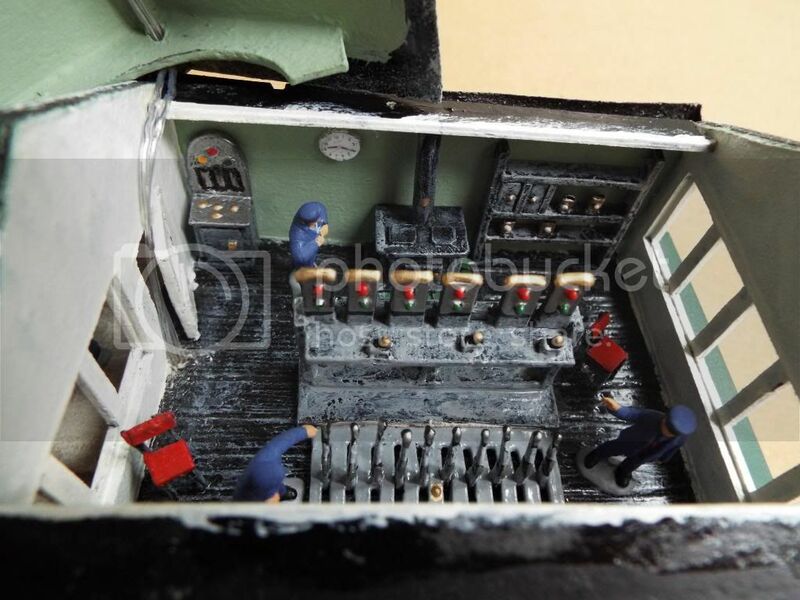 When I was a very small boy,Great Big Steam Trains arrived into the city,full of scrap metal,and I`d watch the iron & steel being cut into bits ready to feed the furnuce in the foundry nearby. The year was 1954 & the scrap loads were hundreds of 105mm Heavy Guns that were no longer needed.They stood alongside the railway track & I along with my little friends played about on them for many days. I have always remembered this,and I intend to model this period in my life,& there will be hundreds of guns to model in the scrapyard that I will create! And lot`s of tiny scruffy kids playing on them too. Thank you kindly for looking. Hi BB, I have sent a personal message to you, have a look. By the way the buildings look really good. You are extremely busy and the houses looks really nice. I like your project and I hope to see the progress here soon! Yes Mabo,I am quite busy & being so keeps me from becoming bored. Working on more then one project means I can often leave what ever I`ve been working on for mounth`s on end, and work on another.This might seem crazy to some, but it saves me from making costly mistakes,and when I return to what ever it was I`d left before,I often come back with fresh idea`s,and improvements! 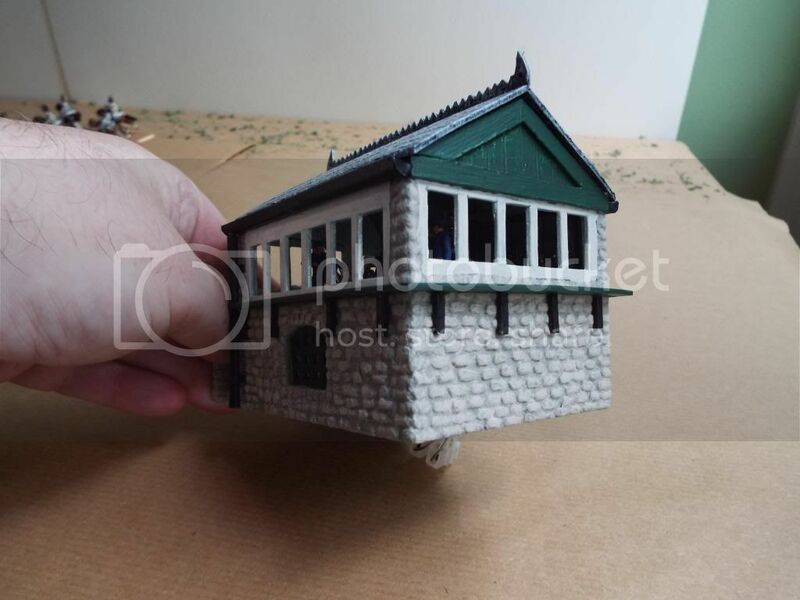 Be it Wrighting,Model Scrathbuilding,Model painting,or doing reserch for projects,or studying Dickens`.Yes I am very busy in my happy Retired way of life. I tend to listen to the TV,being far to busy to watch the darn thing! & (i) often quite grudge the time spent in sleep! (" Little snippets of death!") 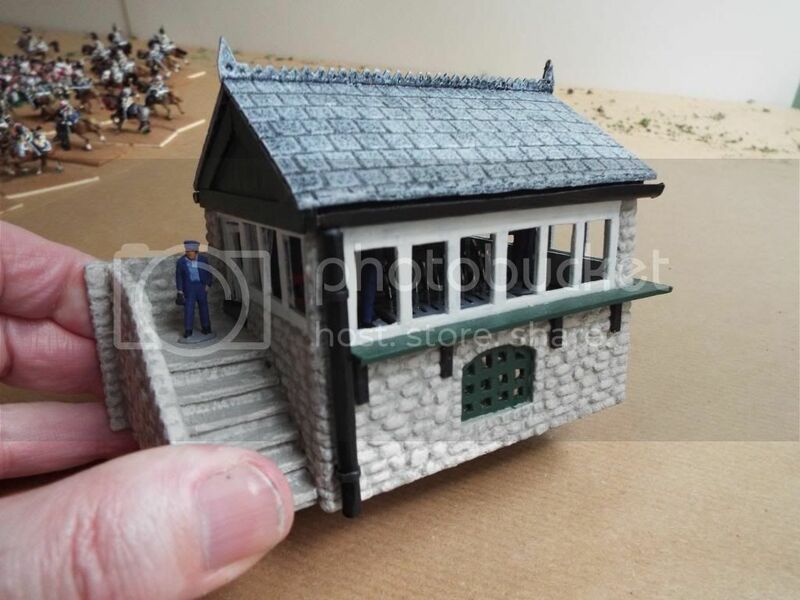 Of late I`ve posted a ton of my work on this Forum,and it`s taken time out from my usual pattern of life,but the aim has been to perhaps help the new ones coming into this vast expanding hobby,& perhaps even the older ones too. So in a few brief week`s I`ve placed about 10 years work of model related things on this Great Forum,set up by Benno. I make no money in the life I lead,however I`m never out of idea`s! 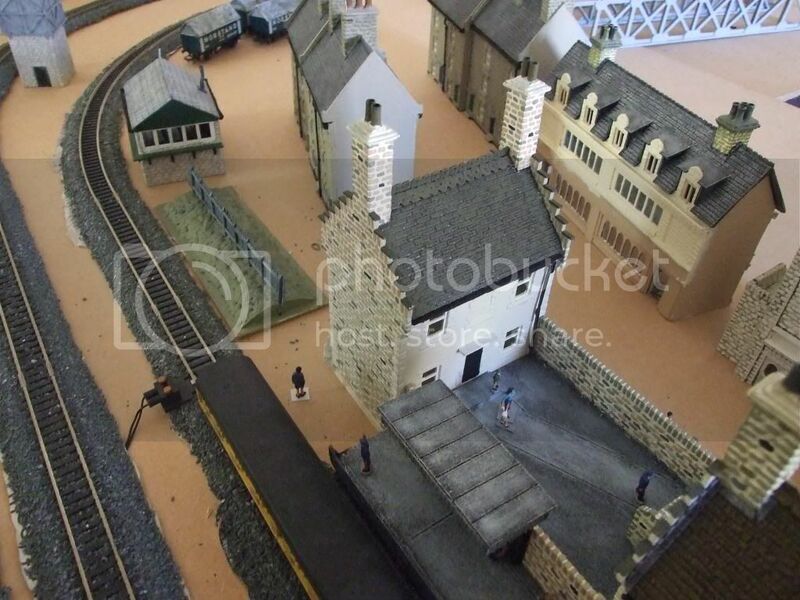 Very soon I`ll be working on the groundwork & the garden of Hougoumont,and whilst working out the street plan of HoneyWell too.Between now & then I have to re-lay 128 foot of oo scale railway track! My! What................................FUN! Thank you for your kind comment & your keen interest too. I have been collecting,ArmouredTrucks,Sherman Tanks ,Matador Truck`s & 5.5 ince Guns,and Oil Drums and other stuff too,and will shortly start building my Scrapyard already mentioned in this Topic. ( Please excuse the Cavalry upon my table) After making HoneyWell Station,it seemed only right that it should have its very own Signal Box. So I made a model. 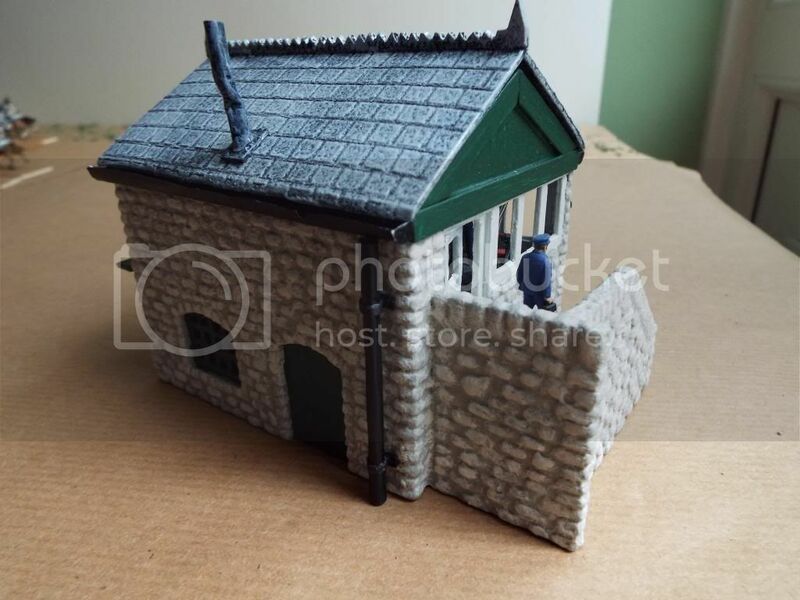 This is my Scratchbuilt Stone Signal Box,but with a difference to others. 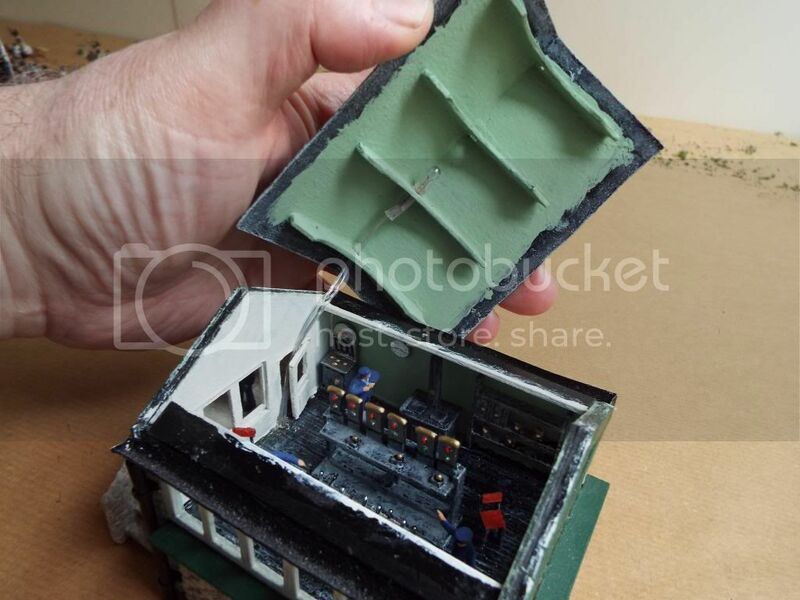 I also modelled the inside and fixed it up with a tiny light.Everything eccept the lightbulb and wire,is made of paper just the same as the Railway Station ........ ...... ...... 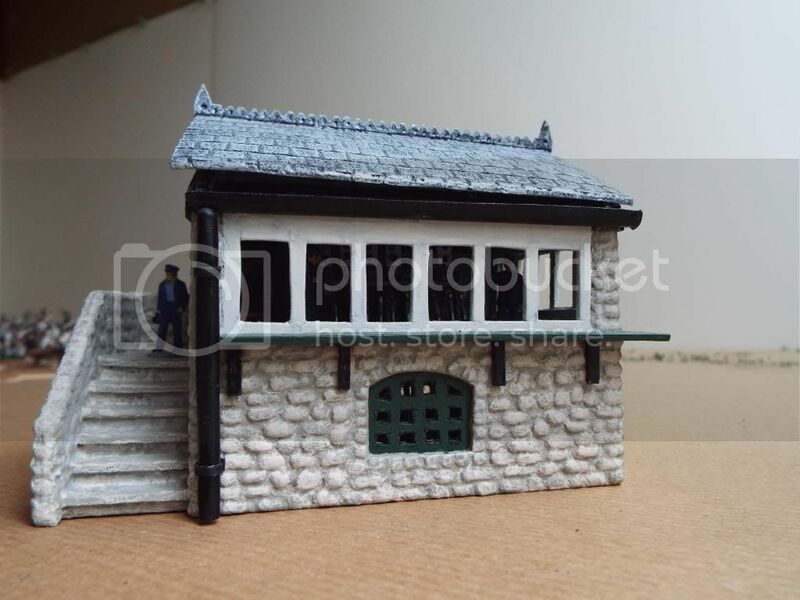 ...................The roofwork is scribed using a pen,and painted with enamal paint and simply drybrush........... The walls are made from paper card too,but the stone work is my very own system of creating brick and stonework.... ...... ....... ......... .. ......... How to model brick walls has already been posted before,and it only requires looking for it on this Forum................I have not put plastic glass into this model because it will soon grimmy up and is a pain to clean,and cleaning scratches the plastic and when the light is on it looks awful. Without glass in the windows they look clean all the time especially when the light is on...........................The inside is made from the same paper card.All the tiny shapes were drawn and designed by me and cut out using a very sharp pointed Craft Knife. 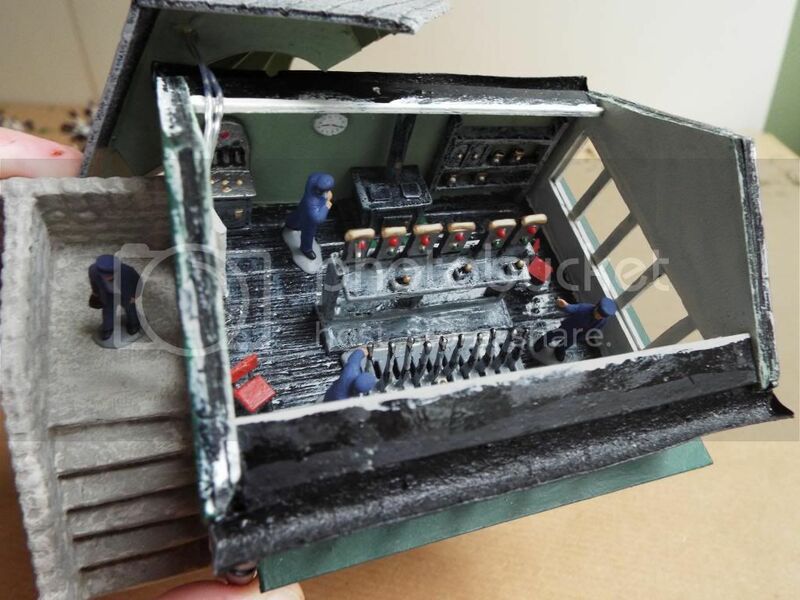 Then painted with enamal paint that soaks into each little piece,and when dry it is as tuff as the strongest plastic,but much cheaper.So all the switches,and everything else that you see including the scribed painted floor is paper card. 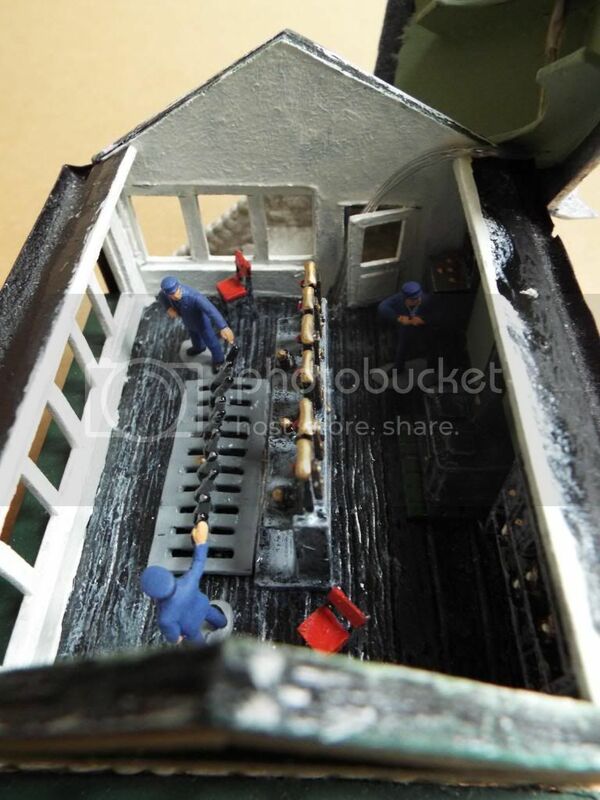 The tiny clock is a picture I took and trimed it down tiny and printed it off..There were only ever two men in a Signal Box,however I wanted to,and did place four,but at the shift change for these workers. So one shift is clocking off,while the other has just arrived for thier shift to begin .... ..Here you can see the little light bulb... .and the tiny clock. .. .They even have a very good stove ,and they can have a strong brew of tea whenever they like,but only after I make a kettle out of Bluetack! . ....So as Harry and Stan start work,Fred and Jimbo are going home. 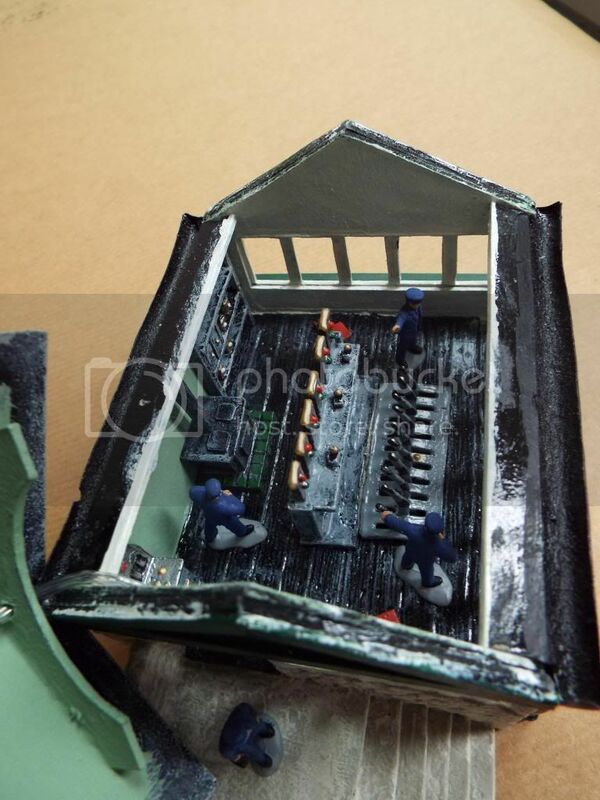 So all I need do now is wire the thing into the power suply,and.......................Oh! Yes make that Kettle,I think it will be a Copper one. 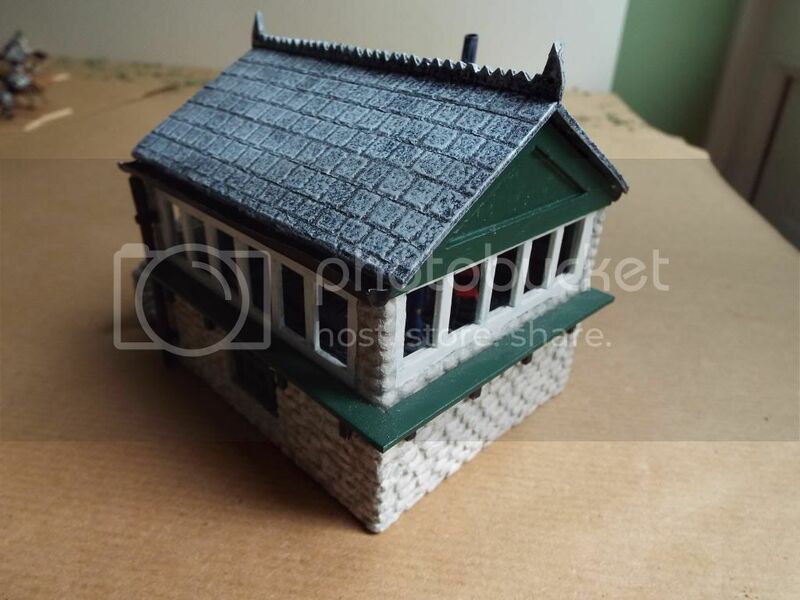 No picture as yet,but I so much liked making the Signal Box and the way everything turned out in the end,that I decided to make another which although basicialy the same size and shape will just be a little bit different and not a copy. There are when complete four railway lines already laid,and I intend to install another one soon. 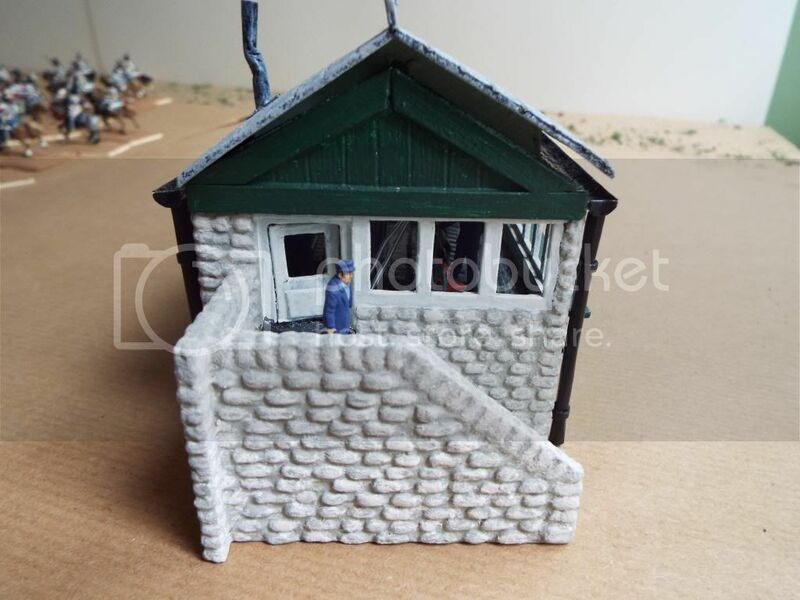 So there is plenty of scope for placing this second tiny 20mm scale Signal Box on the layout too.I`ll post a picture later when this mess I`m working in is cleaned up,and the model is complete and with tiny figures installed.I supose it has cost around £3.00 to make these unique tiny things. "Oxford" ? or another brand ? I've some and I like them a lot.